Sift flour and baking powder together. Set aside. In a clean bowl beat the butter and sugar using a hand mixer. They should be well combined. Add the eggs and vanilla essence and beat again. Pour in the sifted flour and baking powder and combine using the electric hand beater. Line a baking tin with butter paper and pour in the batter. You can also use brown paper. Bake in a preheated oven at 180 C for about 40 minutes. Insert a knitting needle into centre of cake to test if done. The needle should come out absolutely clean. Cool in tin and remove to a plate. Remember to remove paper from the base of the cake. 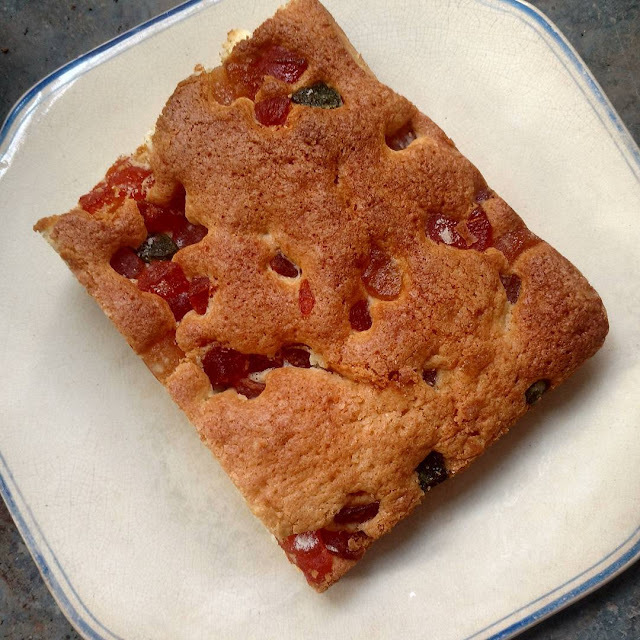 If you like you can cut the cake in half horizontally and spread some warm jam in between. Just microwave a couple of tablespoons of jam in a saucer and spread on the cake. You might also roll some raisins or tutti frutti bits in dry flour and add them to the batter like I've done for the one in the picture above. That is my Hubby's favourite. Sometimes Mom added a generous tablespoon of cocoa powder to the batter with the flour to give the cake a nice chocolatey twist.